J-22, named Oreo, appeared in better shape than Granny in September. 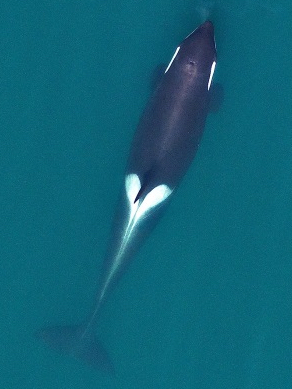 Aerial photos of the orcas also are used by researchers to record social behaviors of the animals, John notes. A photo on his web post shows Granny with J-45, an 8-year-old male named Se-Yi’-Chn, whose mother died in August. Granny and Se-Yi’-Chn were chasing a salmon that was eventually caught by the older animal and shared with the younger one, according to the report. 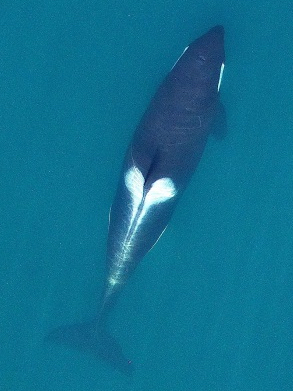 The video (below) explains the ongoing aerial study of killer whales, with John Durban interviewed by NOAA science writer Rich Press. Besides Durban, Holly Fearnbach of Southwest Fisheries Science Center and Lance Barrett-Lennard of Vancouver Aquarium are involved in the photogrammetric project.